Do you have an outfit that's just begging for that final "finishing touch?" Is a special event coming up where you really want to Dress To Impress? Are you in need of a unique gift for the woman who has EVERYTHING? ECOCRAFTWORLD is premium brand of high quality leather products which impress through excellent quality and timeless design. We maintain the highest quality standards and produce a one-of-a-kind fashion accessory. Only a limited amount of each style is produced. Deliciously soft leather is individually hand selected and hand cut, designed and hand-painted. Beautiful things don't ask for attention. It is more than just a bag! 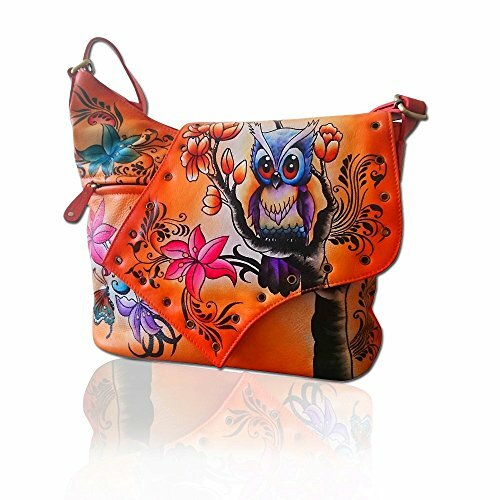 Each bag is completely hand painted unique to you. You can walk around knowing that no 2 bags will ever be the same. You don't have to be royalty to enjoy this beautiful handcrafted, hand-painted Genuine Nappa Leather Hobo Bag so add it to your cart today. GENUINE CALF LEATHER . Deliciously soft leather has tighter grain for softer, more luxurious texture and added durability. RICH VIBRANT COLORS Won't go unnoticed. Make a statement with this beautiful hand painted leather women's tote. This bag's rich colors will compliment any outfit while elegant and the unique design highlights feminine elegance. SAVE 50% PLUS ON YOUR PURCHASE: Now you can finally get a GENUINE LEATHER handbag without breaking the bank and paying 250 $ or more - the best leather shoulder bag at the most economical price! MAKES A STUNNING and SOPHISTICATED GIFT for Your Favorite Lady, even if that special person is You! If you have any questions about this product by ECOCRAFTWORLD, contact us by completing and submitting the form below. If you are looking for a specif part number, please include it with your message.